Gavin and Brian were excited to sleep in their first hotel beds!! We were not (excited, that is) when we realized that the bed rails from Brian's bed at home - and the pool noodles we meant to bring from home - were both still... at home. My intention was to line a double bed with the bed rails and tons of pillows in the bed for Gavin. Then I was going to put the long pool noodles under the fitted sheet on either side to act as bumpers for Brian in his double bed. He's at the point that he probably doesn't need the bed rails - but could benefit from a little input if he were to roll over too close to the edge. But like all great ideas - they get screwed up. After a lot of worrying and polling all my Facebook friends for ideas - we ended up just going to WalMart that night and buying crib rails and pool noodles. 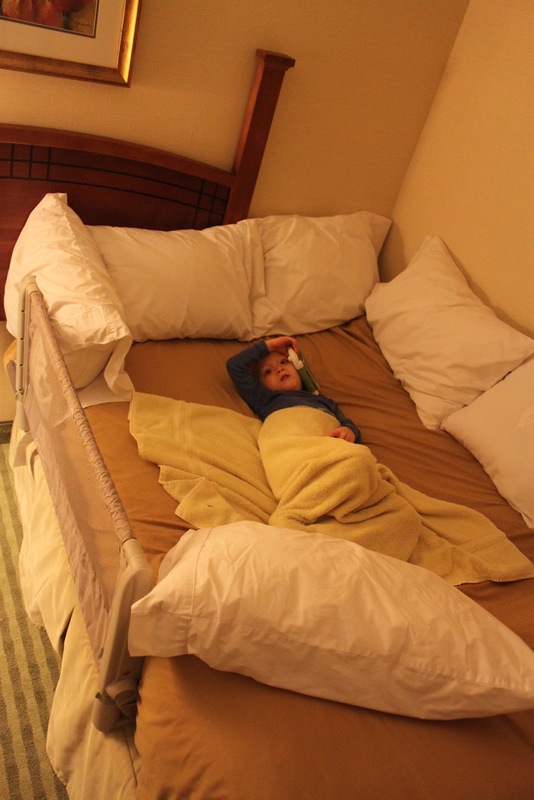 For Gavin's set up - we pushed the bed against the wall, used sheets from home on the bed to protect his sensitive skin, used a bedrail and lots of pillows. Then at the foot of the bed, we rolled up the big comforter and stuffed it under the fitted sheet to create a mountain. That mountain soon became my pillow. Gavin doesn't keep blankets on so I slept in bed with him so I could keep him warm...and make sure he didn't try to "escape" in the night. He did a great job. He's not the easiest bed-mate, but we did do a lot of snuggling so I'm not complaining. Brian did great, too! 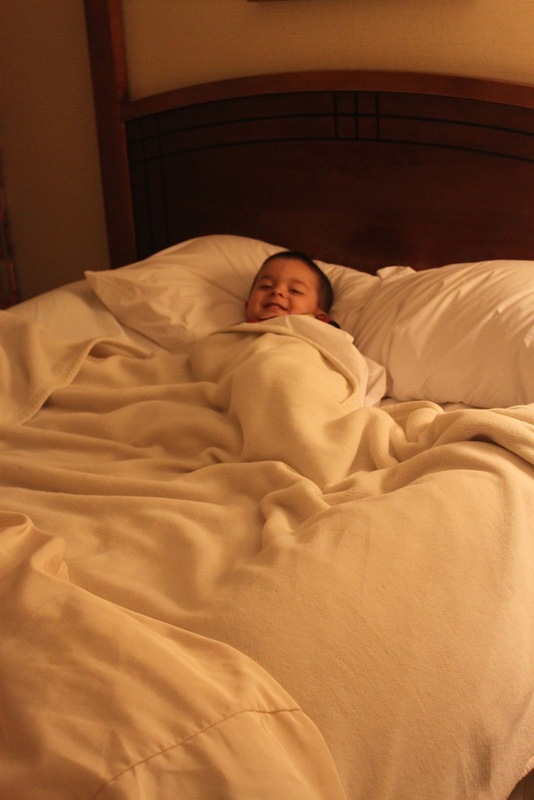 When I took Gavin's picture, he called over from his bed - "Mama - take a picture of me in MY bed!" How could I say no? 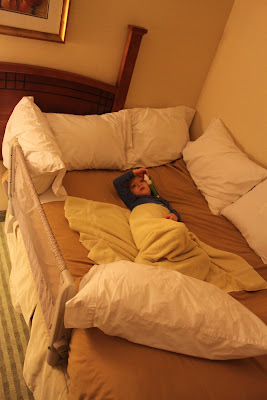 The bed issue is (and will probably continue to be for a while) a concern when we travel with Gavin. He's too big for a pack and play - and although he can fit in a full size crib well enough, we hate to do that to him. And it's not always possible to travel with a big crib. Ed and I are considering purchasing a "Nickel Bed Tent" for future trips. Click the link to check it out. And if you have one, please let me know how it has worked for you!! Ed booked us in a two room suite which was perfect. We had enough living space - and a kitchen so we could store and heat up all of Gavin's food. That's a necessary set up, we've come to realize. The first night we were here, we met up with Ed's sister and some of his cousins for a fun dinner! Feeding Gavin and Brian ahead of time was one of the best ideas I ever had (besides marrying Ed, of course). It gave Ed and I the ability to focus on conversations and relax a little. Gavin was a little bit overwhelmed at first with the crowd and the restaurant noise, but we brought in his portable DVD player with his favorite "Little Einstein" movie and he was thrilled for the entire time. Brian worked the crowd and played with some toys I brought with us. And I also met Ed's cousin, Karin, and her beautiful twin daughters - Claire and Elizabeth. It was a really nice evening. Saturday morning we were up and out after breakfast. We stopped at one of the best grocery stores in America - Stew Leonard's. I *almost* love that store as much as Wegman's. Ed wanted to pick out flowers to bring to his parents...and, of course, we left there with twenty other things that we just couldn't resist. The main goal of our trip was to visit the cemetery and pay our respects to Ed and Kat's Mom and Dad. It was important to him to bring his family there. And it was very nice that he and his sister were there together - I know his parents must have loved that. As we were there, the strangest thing happened. I saw a butterfly cross over in front of the headstone...and Brian adorably ran off to chase it. As we watched him, it was like the butterfly was playing with him. It would fly away and then come back - then it would circle around him - then fly away again - and it even seemed like it was playing hide and seek. I know how crazy it sounds...and you can draw your own conclusions...but I'm pretty convinced that Ed's parents were playing with their grandson. And it made us very happy. After lunch back at the hotel, we left again to go visit Ed' good friend - and our best man - John, his wife Lara and their children Jack, Ted and Sam. It's sad, but the last time we saw John and Lara (in person - not on Facebook!) was at our wedding. She was pregnant with Jack. 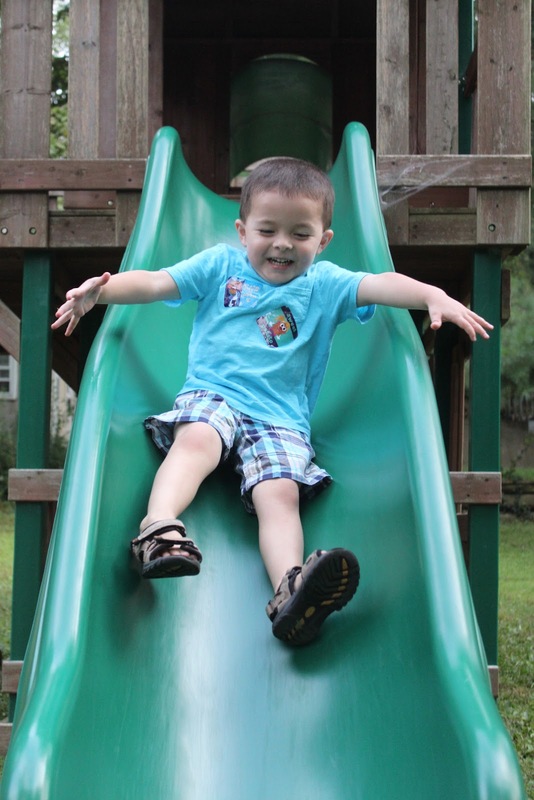 Today we were there to celebrate Jack's eighth birthday. Oh, how the years go by. ...and Brian was his usual gregarious, social self. He had a ball getting dirty and running himself at full speed with the boys in the back yard! It was also wonderful for us (especially Ed!) to see John's parents, Joanne and Dan. 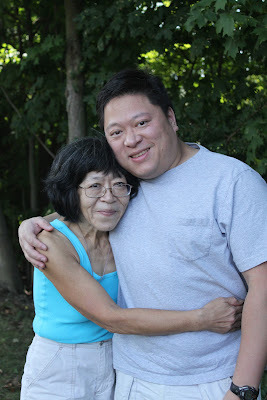 Growing up, they were like second parents to Ed - Joanne still refers to him as her "second son." They're two of the kindest people we know. And it was nice for me to finally met Lara's Mom and Dad - Barbara and Ron. Ron and Brian became fast friends - and I enjoyed chatting with Barbara who once worked in special education in Pennsylvania. Driving back to the hotel - or the "home-tell" as Brian calls it - Ed and I both shared the same feeling about our day with our friends. Going there for the afternoon felt like going home. That's a wonderful feeling. But then again, they are wonderful people. 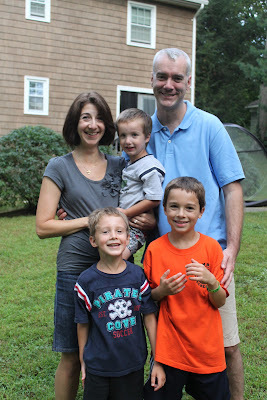 And I feel lucky that my Connecticut relatives (by marriage and friendship) have welcomed me so kindly! We're headed home tomorrow...just in time to get ready for the BIG DAY. Gavin's first day of school. Kate- I'm sure you already know about these, but just in case: we still use the Halo Sleep Sacks for both our boys since they move too much in their cribs still for blankets. I've been able to get the larger sizes at babies r us and they love them! And "one step ahead" has some great travel bumpers that are inflatable. I do! We love those Halo Sleep Saks - and I have two for Gavin. Believe it or not, he was wearing one at the hotel - but you know how air conditioners in hotel rooms can get so cold? His little ears were freezing. And I have seen those bumpers - not a bad idea if we fly somewhere! For now, I'll just throw the cheap noodles in the back of the car.